Etymology and the European Lexicon enthält die Akten der 14. Fachtagung der Indogermanischen Gesellschaft, die vom 17. bis 22. September 2012 in Kopenhagen stattfand. Die 43 Beiträge des Bandes behandeln eine Vielfalt von Themen unter dem Rahmenthema Etymologie. 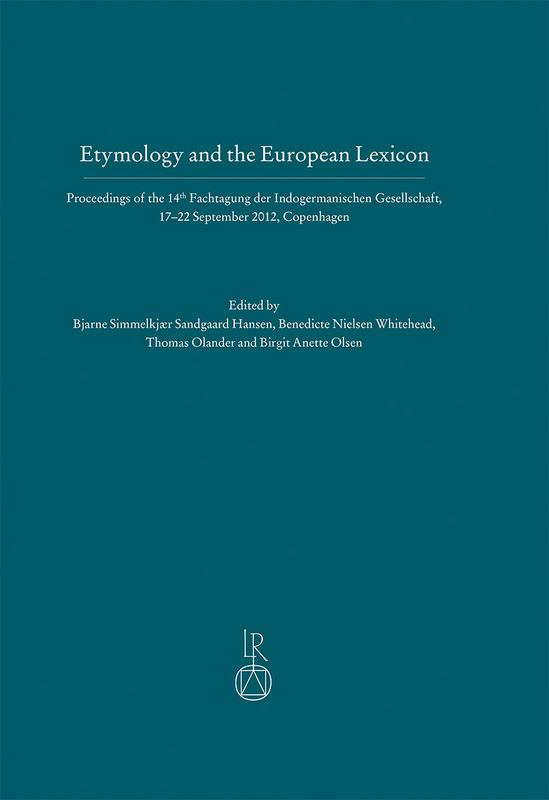 Etymology and the European Lexicon constitutes the proceedings of the 14th Fachtagung of the Indogermanische Gesellschaft, held in Copenhagen 17–22 September 2012. The choice of etymology as the general theme of the conference was partly motivated by a natural wish to take up this fascinating field for new discussion more than thirty years after the magnificent volume Lautgeschichte und Etymologie following the 6th Fachtagung in Vienna 1978. Another reason was the research focus characterizing the Indo-European section at the University of Copenhagen since 2008 where we had the privilege to receive funding for a five-year project, Roots of Europe – language, culture, and migrations. Etymology is the obvious link between language and the outside world, and with an increasing interest in prehistoric migrations and language contacts, we felt confident that the conference would shed new light on the processes eventually leading to the linguistic landscape of present-day Europe. Among the 43 contributions, fitting neatly within the Rahmenthema, a rich variety of subjects are covered, from the etymological interpretation of specific words of Indo-European extraction to lexical evidence for the disintegration of the language family, loan word relations between Indo-European and non-Indo-European languages and the basic concepts of historical semantics. The languages under discussion include not only all the Indo-European branches, but also the assumed substrata found in the lexicon and in toponyms all over Europe. The volume thus marks the beginning of a new, focused investigation of the layers the European lexicon seen in a cultural context which will undoubtedly flourish in years to come with the combined efforts of linguists, prehistoric archaeologists and geneticists. Birgit Anette Olsen (geb. 1952), Dr. phil. habil., ist Professorin für indogermanische Sprachwissenschaft an der Universität Kopenhagen. Ihre Forschungsschwerpunkte sind Armenisch, indogermanische Morphologie und das indogermanische Lexikon. Benedicte Nielsen Whitehead (geb. 1965), Dr. phil., promovierte an der Universität Leiden im Gebiet Indogermanistik. An der Universität Kopenhagen, wo sie derzeit als Lektorin tätig ist, war sie Mitarbeiterin an den Forschungsprojekten Roots of Europe und Individual, kin and family in prehistoric Europe. Ihre Forschungsschwerpunkte sind Latein, Vedisch, Morphologie und Nominalkomposition. Bjarne Simmelkjær Sandgaard Hansen (geb. 1984), Dr. phil., unterrichtet Dänisch für Ausländer. An der Universität Kopenhagen war er Mitarbeiter an den Forschungsprojekten Roots of Europe und Individual, kin and family in prehistoric Europe. Seine Forschungsschwerpunkte sind Germanisch, Nordisch, germanische Phonologie und Morphologie." Thomas Olander (geb. 1974), Dr. phil. habil., ist Lektor für indogermanische Sprachwissenschaft an der Universität Kopenhagen. Seine Forschungsschwerpunkte sind Slavisch, indogermanische Phonologie und Morphologie, indogermanische Sprachen und Archäologie.